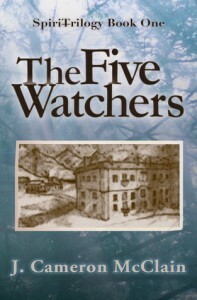 The Five Watchers by John Cameron McClainReviewed by Lucy PireelWhat can I say? A more than satisfying read. Almost from page one I was freaked out, very pleasantly freaked out. This book takes scary onto a whole new level, into the realm of reality, and beyond what we can see, or understand. There were moments I had to put the book down because of sounds in the house I couldn’t place—yes, I got scared by reading a book. All in the mind of course, but that’s where it takes you, in your mind and deeper still.It’s not only scary, but it’s also gross—in a good way, a Clive Barker way—suspenseful, and utterly compelling. Mister McClain has the skills to go beyond writing a mere horror flick. This is major league freaking out and I must read more on Shady Glen, even if it has me checking under my bed and fearing cold air.It has the whole range of emotions, great imagery and not quite unimportant it’s gripping you by the hairs, drags you along and forces you into believing it’s real. Until you put the book down, then you start convincing yourself it is only make believe, which—believe me—isn’t easy. It’s a figment of imagination. But boy, what great imagination. Move over Pinhead, cause The Malevolence is coming to take your place and if you don’t go quietly it will gobble you up for breakfast.All of its pages had me glued to them. The book read like a freight train full speed through the station, more than well worth your time and money. I’d recommend this to anyone up for a thrilling read, but best leave the lights on.